Based on the non-fiction book (which was a great read), director George Clooney returns with composer Alexandre Desplat after 2011's Ides of March. In a throwback to old 1950s and 1960s WWII films, Desplat composed a lively British-style march. Heard throughout the score as the full march and in variations, it is purposely reminiscent of films like The Bridge on the River Kwai (1957) and The Great Escape (1963). Here is my rundown/review of The Monuments Men album - spoilers in track titles - so consider that a warning. Beginning with The Roosevelt Mission, we get the trappings of a war score - the snare drum, noble sounding horn fanfare (which reappears many times throughout the score) and a solo trumpet theme. (I'll refer to this as the Mission Theme). The theme expands, with the orchestra fluttering in, adding to the heroic nature of the score. Opening Titles features the jaunty theme for the Monuments Men as they are selected for the team. It's a catchy melody, somewhere fitting between Desplat's Fantastic Mr. Fox (2009) and Powell/Gregson-Williams' Chicken Run (2000). The track ends with a bit more menace, a bit of a motif that appears alongside the menace of the film. Ghent Altarpiece has an almost religious chorale sound, before adding in the menace motif in the low strings and low woodwinds. Champagne starts with a light music box-style waltz, it quickly turns faster with the brass coming in and the strings charging. Basic Training begins with a quick variation of Mission Theme heard earlier, this time with a more comic touch, before the Monuments Men Theme comes in. Normandy begins with a slower and string led version of the Mission Theme, slightly rising to the finish. Deauville features a minor waltz with ominous low string undertones. It ends with a brief string pizzicato Mission Theme. Stokes features the Monuments Men Theme on solo piano, with a jazz-like background and a section letting the cello section take over. A villain-like motif starts right at the opening of I See You, Stahl. It builds upon itself, rising with the brass and swirling strings. Later, we get one of the bigger renditions of the Mission Theme, a big more bombastic than previous incarnations. John Wayne features the melody heard in the previous track, then switching to a lighter pizzicato and woodwind section before turning a bit more sinister and mysterious. There is a comic version of the Monuments Men Theme (complete with bouncing tuba, triangle and piccolo). Sniper is another action cue, pushing the music along with a tapping gesture. The orchestration is a bit off-kilter, and snippets of the Monuments Men Theme on piano over tense-sounding strings. Into Bruges starts with the bass clarinet chugging away as the suspense takes over, with a slight minor variation of the Mission Theme. A moment for percussion gives way to the strings before tapering off. The Letter begins with a solemn tune for brass and woodwinds. Over a repetitive drum pattern and low strings, a piano solo takes the lead before growing into a stirring lyrical section with the whole orchestra. Not lasting long, it goes back to minor with the piano solo. The Nero Degree gives more momentum to the score, with the music box waltz jarringly fit in. Stahl's Chalet is a short waltz, fitting the score like source music. Jean-Claude Dies begins with a flute solo, turning to a suspenseful cue with the brass and percussion kicking in. A sentimental variation of the Monuments Men Theme appears, with subtle chord changes and led by piano and strings. Siegen Mine starts with similar bass pizzicato and percussion tapping - his sneaking motif I suppose. Later in the track, we get a brass choir rendition of the Monuments Men Theme. Claire & Granger is a tender track, with harp and strings at the forefront. A lovely track, it reminds me a bit of the sweet music from Benjamin Button (2008). The track shifts to another action variation of the Mission Theme - a joyful urgency this time. Gold! opens with a glistening pattern and a bold variation of the Monuments Men Theme, before becoming more relaxed ending with a solo oboe. Heilbronn Mine continues the sneaking motif, keeping the suspense before the sparse piano solo takes over. It shifts into the Monuments Men Theme on piano and some building fanfares in the brass. Castle Art Hoard is a great track, letting the orchestra have a magical moment, fitting nicely with the matching scene. The fast-paced patriotic style returns with a bit of quirkiness in Altaussee. Finale is the longest track of the album, returning to the sneaking motif and villain motif. Bits of past themes make appearances as well, along with a train-like rhythm with blaring brass. The waltz reappears, as well as the Mission Theme on solo piano. The music grows with the horn fanfare to the finish. End Credits is the whistling variation of the Monuments Men Theme (with some cast members doing the whistling) and one last run of the theme. Tacked on the end of the album is the source song "Have Yourself a Merry Little Christmas", used earlier in the film, sung by Nora Sagal. (For those historical nitpickers, they use the revised lyrics from the 1950s). It wouldn't be right to not mention the cameo/acting debut of Alexandre Desplat as Emile - not often does a composer score a scene in which he appears. 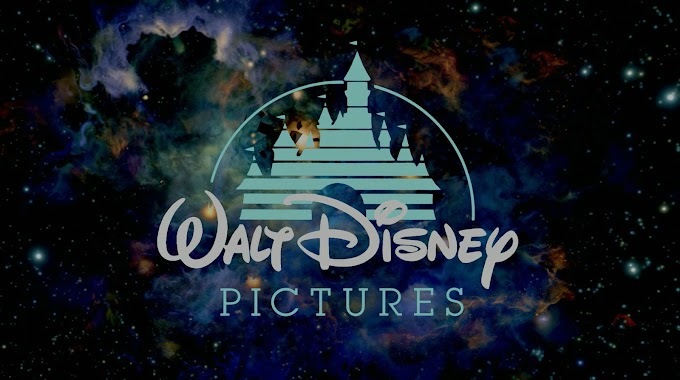 While the film suffers from the shifting of tones, Desplat's score fits right in the balance. 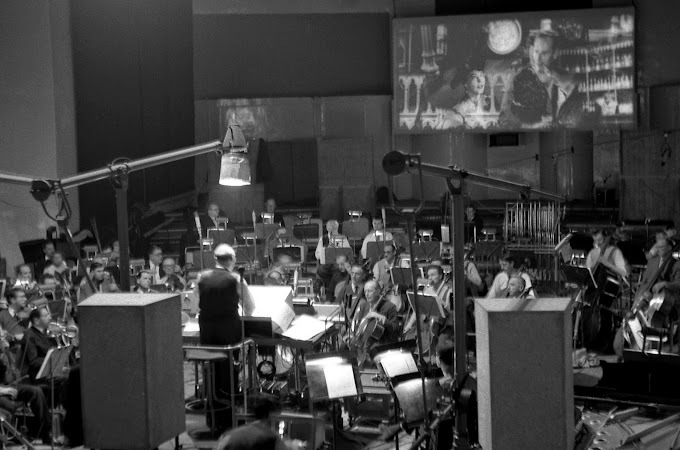 The score straddles both the comic sides and the menacing drama, often times using the same themes for both with only changes in tempo and instrumentation. It fits well following in the footsteps of similar film scores and makes you appreciate those Elmer Bernstein, Ron Goodwin, John Williams and Malcolm Arnold scores. 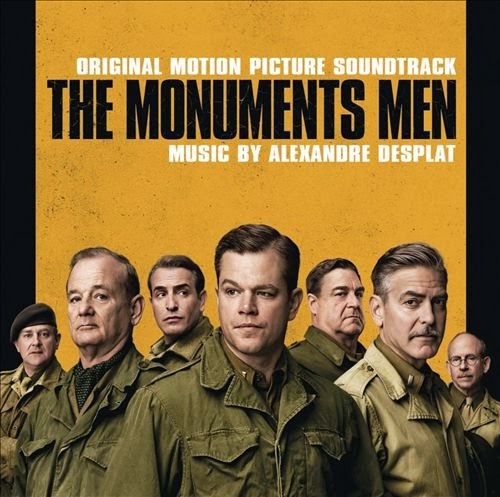 Overall, The Monuments Men is a nice addition to the eclectic list of Desplat's work.